“Then Came Sunday,” ©Lynn Abbott. Used with Permission. Grief can be a dark place. Or as David so aptly described it in the immortal Psalm, we walk through “the valley of the shadow of death,” (Psalm 23:4). I think its capable of such devastation because, after all, we are not wired for grief. Indeed, God’s perfect plan for humanity never included death. However, the first couple’s blatant disobedience in Eden’s garden changed all that; both sin and death entered the world. And grief clutched humanity’s heels. Indeed, the valley of shadow sometimes feels like a steep ravine. Darkness closes in, and you and I feel lost… and even alone. I imagine the disciples felt very alone immediately after the cross. Peter and John had been eye witnesses to the demands of the angry mob: “Crucify Him!” The courtyard rang with the mob’s chant. At times, the valley of shadow feels like a steep ravine. The love expressed by the crowd on Palm Sunday swiftly slipped away. In its place, hatred loomed. It’s no wonder Peter feared for his life. There was no telling where the mob’s madness would end. And although Peter and John could not boast in a university education or in a thorough understanding of social science, they had enough sense to know that they were next on the hit list. Fear certainly compounded their grief. And there was plenty of grief to go around. Their beloved Rabbi had been crucified. All their hopes, dreams and convictions rattled to the core. Jesus–of whom Peter had said, “Thou art the Christ, the Son of the Living God,” (Matthew 16:16)–had been executed by the most brutal means of the day. And Joseph of Arimathea and Nicodemus had buried Jesus. What was it that Jesus had said in His final moments? Some fled Jerusalem (Mark 14:27; Zechariah 13:7). Those, remaining in Jerusalem, hid. The love expressed by the crowd on Palm Sunday had swiftly slipped away. Actually, it’s not surprising that she returned to the tomb while it was yet dark. After all, being associated with Jesus had become extremely dangerous. But visiting the tomb was a risk that Mary had to take. Her grief demanded it. She may have worried on the walk about how she would approach the tomb. After all, a guard had been set and the governor’s seal given. Nearing the tomb, she likely caught her breath. Not only were the soldiers gone but the stone had been removed. In her shock, she forgot the purpose of her journey. She immediately ran to find Peter and John. 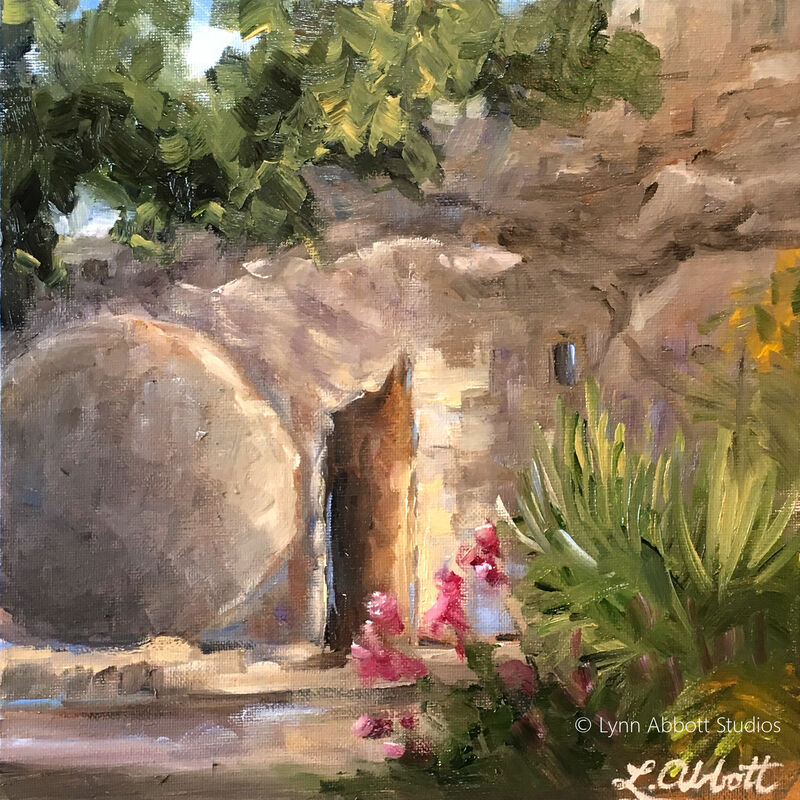 “They have taken away the Lord out of the tomb, and we do not know where they have laid Him,” she cried, (John 20:2). And Peter and John immediately ran to the tomb. Discovering the empty tomb, they believed Mary’s report, (John 20:8). Yet, Scripture notes they did not yet understand the Resurrection, (John 20: 9). So they went home; initially, no more enlightened than they had been before Mary’s announcement. The change in events probably perplexed them. Fear certainly compounded their grief. Mary had evidently followed Peter and John to the sepulcher. Perhaps, she was anxious to see her report confirmed. I’m sure that heartbroken Mary tried to defend her claims. Her beloved Messiah had died on a cross; her closest friends had dismissed her. Pushing back tears, she stood watching Peter and John enter the tomb. At least her report was vindicated. Nevertheless, I’m sure hurt and grief overwhelmed her. Lost and alone even among friends. Empty, like the tomb. Darkness threatened her emotional landscape. When Peter and John left, Mary remained. Tears flowed. The water dam broke. Yet, in that moment, Grace dawned softly, (John 20:11). It did not condemn. It did not condescend. It did not lecture. Mary spilled her heart,”Because they have taken away my Lord, and I do not know where they have laid Him,” (John 20:13). She turned, perhaps to leave. And there standing quietly was someone she presumed to be the gardener. Again, a gentle, quiet, tender and compassionate voice met her in her dark hour. “Woman, why are you weeping? Whom are you seeking?” He asked, (John 20:15). In that moment, Grace flooded Mary’s horizon… light overcame the darkness. And Mary cried, “Rabboni!” Teacher. She had nearly missed her Savior. In deep grief, she had not immediately recognized Him. Even so, He was there, ready to give comfort and hope to His heartbroken child. He slipped in softly. He walked with Mary in her garden of grief. And gradually, grace illuminated her path. The Light of the World rose. Sin and Death had been defeated. Without a doubt, Christ’s resurrection changed everything. Not only did Christ live, but His sacrifice enabled our resurrection hope. His scars ushered in Grace beyond all this world had ever known, (Isaiah 53:6). “But He was pierced through for our transgressions, He was crushed for our iniquities; The chastening for our well-being fell upon Him. By His scourging we are healed,” the prophet wrote, (Isaiah 53:5). His scars… proof of the battle our Savior has won. On Thursday, the crowds had clamored for His crucifixion. On Friday, still others shouted abuse and mocked Him. Thunder roared and the earth quaked, announcing the completion of God’s sacrifice for sin. When you and I feel we cannot go on, when pain threatens to shatter our hearts, when the world seems a dark tunnel or an impenetrable ravine, our Sovereign-Shepherd calls tenderly: I am here. The empty tomb brings comfort like no other. In the darkness, grace nudges … “My child,” He quietly calls. And as we cry, “Rabboni!”– we see light filling the horizon. Indeed, Great Grace calls us out of our great grief. And even though we yet temporarily traverse “the valley of the shadow,” we do not walk alone. Our resurrected Savior assures us, “… I am with you always…” (Matthew 28:19).